If too much phosphate is present in the water the algae and weeds will grow rapidly, may choke the waterway, and use up large amounts of precious oxygen (in the absence of photosynthesis and as the algae and plants die and are consumed by aerobic bacteria.) The result may be the death of many fish and aquatic organisms. Phosphorus is one of the key elements necessary for growth of plants and animals. Phosphates PO4— are formed from this element. Phosphates exist in three forms: orthophosphate, metaphosphate (or polyphosphate) and organically bound phosphate. Each compound contains phosphorous in a different chemical formula. Ortho forms are produced by natural processes and are found in sewage. In water, they change into the ortho form. Organic phosphates are important in nature. Their occurrence may result from the breakdown of organic pesticides which contain phosphates. They may exist in solution, as particles, loose fragments or in the bodies of aquatic organisms. Environmental Impact: How phosphorous affects aquatic life. Rainfall can cause varying amounts of phosphates to wash from farm soils into nearby waterways. Phosphate will stimulate the growth of plankton and aquatic plants which provide food for fish. This may cause an increase in the fish population and improve the overall water quality. However, if an excess of phosphate enters the waterway, algae and aquatic plants will grow wildly, choke up the waterway and use up large amounts of oxygen. 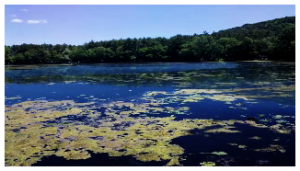 This condition is known as eutrophication or over-fertilization of receiving waters. This rapid growth of aquatic vegetation eventually dies and as it decays it uses up oxygen. This process in turn causes the death of aquatic life because of the lowering of dissolved oxygen levels. Phosphates are not toxic to people or animals unless they are present in very high levels. Digestive problems could occur from extremely high levels of phosphate.